The current model for the 3rd year medical student rotation is within the UCLA surgery outpatient rotation. This curriculum allows medical students to diversify their knowledge during week long rotations in various surgical sub-specialties such as: Anesthesiology, Urology, Ophthalmology, Plastic Surgery, Orthopaedic Surgery, and Neurosurgery. During this time, the medical student has the opportunity to experience the outpatient and inpatient aspects of a tertiary neurosurgery department. This allows better understanding of the pre-operative decision making process, the various complex neurosurgical operations, the post-operative management of these patients, and follow-up care for these patients. This 3 or 4 week rotation is an invaluable experience for the student considering a career in neurosurgery. The student is offered a good balance of outpatient experiences, clinical duties, and operating room exposure. 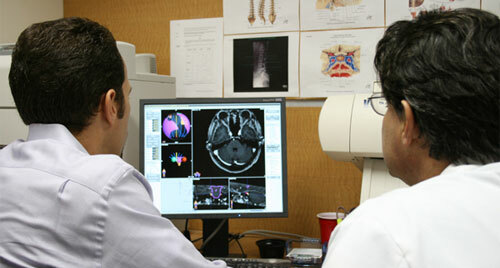 The bulk of their time is spent at the Westwood campus (Center for Health Sciences), where a wide variety of neurosurgical pathology is seen including cerebrovascular (both surgical and endovascular), tumor (malignant, benign, skull base etc..), functional and epilepsy, pediatric, spine surgery, trauma, peripheral nerve and radiosurgery. The medical student is heavily incorporated into the neurosurgery team. Duties include heavily participating during morning rounds, operative assistance, post-operative patient care, and clinic. Students are required to participate in all educational activities with the residents and are encouraged to prepare a presentation for the faculty and residents. Students are encouraged to spend time at various UCLA neurosurgical facilities with the residents, such as learning comprehensive spine surgery at the Santa Monica-UCLA spine center, learning functional surgery and radiosurgery with Dr. Antonio DeSalles, and experiencing indigenous and polytrauma care in county hospital system at Harbor-UCLA. They will also be exposed to cutting edge technologies such as the intra-operative MRI suite, Asleep-Awake-Asleep craniotomies, and minimally invasive endoscopic assisted spine and cranial surgery. Learning objectives for the sub-intern includes a wide exposure to the diverse pathology in neurosurgery, gaining a good understanding of managing neurosurgical trauma and critical care patients, learning basic and advanced management of intracranial pressure, learning basic bedside procedures (e.g. arterial lines, central lines, lumbar punctures, lumbar drains, ventriculostomies, subdural drains etc. ), and learning basic operative skills. International students are welcome to participate in our three-week clerkship between February-May. Please review application requirements http://www.medstudent.ucla.edu/offices/visiting_students/internq4.cfm and contact cbruton@mednet.ucla.edu to confirm availability.